The raffle drawing event is on Wednesday, January 18, 2017 at Urban Taco, 3411 McKinney Ave, Dallas, TX 75204. The event starts at 5:30 PM and the drawing is at 7 PM. You don't have to be present to win. Door Prizes will be awarded to several lucky attendees! Thank you to Chuy's, Celebration, Iron Cactus, Lazy Dog, and Firebird Restaurant Group for their donation of gift cards and certificates! We need your help! We are gearing up for our annual fundraiser to benefit Dog & Kitty City, Dallas's only no-kill animal shelter. Please consider donating a prize to be raffled off in January 2017, which will raise money to feed, house, and provide medical care for our dogs and cats until they are adopted into forever homes. We are a 501 (c)(3) nonprofit organization and rely solely on private donations. Thank you for your support! The Humane Society of Dallas County is participating in the eighth annual North Texas Giving Day on September 22, 2016! You can give to our shelter by going to NorthTexasGivingDay.org between 6 AM and midnight to make a monetary donation which provides much need funds to our shelter. Any donations $25 to $50,000 will be multiplied by $2.5 million in bonus funds and prizes and if Humane Society of Dallas County receives a donation we’ll receive a portion of the bonus funds. As a 501.c3 non-profit organization, we rely on the generosity of all our donors and all we do could not be made possible without all of your charitable contributions. 8/4/2016 The raffle is closed! The raffle drawing is on Saturday, August 6th, 2016. You don't need to be present to win. 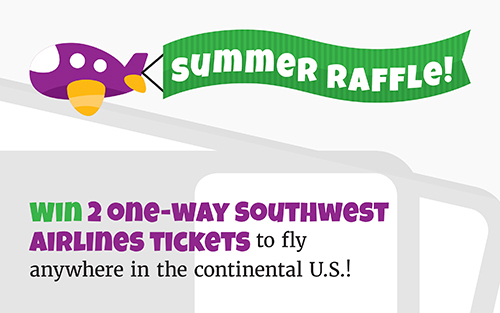 Two One-Way Tickets from Southwest Airlines -- fly anywhere in the Continental United States! JUST IN TIME FOR MOTHER'S DAY, we're highlighting all the great mother cats awaiting adoption at Dog & Kitty City/HSDC. All of these furry moms arrived at our shelter doorstep with a litter of babies and some of them even did double duty nursing abandoned kittens that may have arrived as stragglers. These lovely spayed moms are available for a special adoption fee of $50 during the month of May. Betha came to us as a mom of 2 kittens. She has been spayed and is ready for a home of her own! Betha is extremely friendly and loves to play with toys. She loves to be pet by all the volunteers that come to visit and jump on a free lap. She would be great in a home with other cats, a calm dog, or children! Darlene and her kittens came to Dog & Kitty City from a kill shelter that could not take the tiny ones into their adoption program. Darlene was an outstanding mother. She raised her babies to be friendly and goofy. Darlene has a bit of the goofiness, too, and she often joined the gang in playtime and nap time. She loves to toss fuzzy mice around, bat plastic balls with bells inside, and swat at dangling feathers and string. Darlene also loves meeting new people, and she is pleased when she receives strokes and pats. She is a calm and quiet cat who will make as wonderful a companion as she has made a mother. Click "Read more.." to read about all our 18 mom cats you can adopt! This is Sparky. She was found and brought to us in this condition. Her eyes are so severely infected they will have to be removed after a round of antibiotics and pain killers. She is already completely blind. Her teeth are in terrible shape as well and she has skin allergies to top it off. She is probably around 5 but it's hard to tell with her conditions. We're guessing Maltese mix. She is still a sweet dog despite being blind, in pain, and itchy. Help us by donating, sharing or volunteering! Become Sparky's Guardian Angel. Bring your pups to Mutts Cantina for a picture with the Easter Bunny! We will have several of our adoptable dogs at the dog park for an afternoon of fun. Come out to Community, grab a cold brew, and meet some of our adoptable dogs! We will have cool new merchandise on hand to help raise money for Dog & Kitty City.